Here’s a trivia question: What do Ondřej Pavelec, Jaroslav Halák, Michal Neuvirth, Peter Budaj, Robin Lehner and Anton Khudobin all have in common? The obvious response would be that they are all goaltenders who have dressed for at least one NHL game in 2011-12. That is just part of the answer, though. All of them are former CHL import goalies. In nearly two decades, a multitude of European-born import goalies have appeared in the Canadian Hockey League from 11 different countries; these nations have varied from hockey hotbeds, such as Russia, the Czech Republic and Finland, to places starting to forge their identities in hockey, including Wales, Hungary and Denmark. Out of the 59 teams of the CHL last season, not counting ones created out of relocation, 39 of them have had at least one import goalie appear in net in team history. The OHL leads the way with 18 of their 20 teams employing the services of an import goalie over the course of the team’s existence, with the Kitchener Rangers and the Owen Sound Attack being the only exceptions. In the QMJHL, teams that have benefited from a European-born netminder include two former franchises, the Lewiston MAINEiacs and the St. John’s Fog Devils (who have since relocated twice and are now the Blainville-Boisbriand Armada). And the WHL is just starting to begin to reap the rewards of goalies from across the Atlantic, with former netminders Alexander Fomichev (Calgary Hitmen) and Juha Metsola (Lethbridge Hurricanes) the holders of modern franchise goaltending records. In 2011-12, a record 13 import goalies played in the CHL from five different countries. Eight were in the OHL, three in the QMJHL and two in the WHL; despite that incredible amount, the number could have been higher. 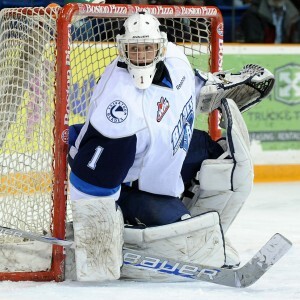 Two netminders chosen in the 2011 CHL Import Draft, Washington Capitals draft pick Steffen Søberg (sixth overall, Swift Current Broncos) and Vancouver Canucks prospect Jonathan Iilahti (39th overall, Vancouver Giants), chose not to report to the respective teams who selected them. If Søberg had reported, he would have become the first Norwegian goaltender to ever play in the WHL. Nevertheless, it is astounding to recognize the development of the import goaltender from a sometime occurrence to an absolute necessity. So who are these men behind the masks who have set such an impressive record? Let’s look at them a bit closer. In 2011, Andrey Makarov found himself in a unique position: Having to switch not just teams, but leagues. A 6’1″, 178-pound native of Kazan, Russia, Makarov was chosen 42nd overall in the 2010 CHL Import Draft by the QMJHL’s Lewiston MAINEiacs. He was brought in to be the backup for overage goalie Nicholas Champion and he managed to appear in 27 games, registered a 11-12-1-1 record, a 3.37 goals-against average and an .890% save percentage; he also recorded two shutouts. After the MAINEiacs folded in 2011, all of the North American players who still had junior eligibility were assigned new teams through a dispersal draft. Makarov and fellow Russian import Kirill Kabanov were to either be traded or re-enter the CHL Import Draft; while Kabanov was traded, Makarov was not. In necessity of a solid #1 goalie, the WHL’s Saskatoon Blades chose the Russian puckstopper with the 30th overall pick in the 2011 CHL Import Draft. Makarov immediately made an impact, registering six straight wins to start his WHL career. Remarkably, that was not his win streak in 2011-12; he also had a seven-game victory chain from November 8-22, 2011. In December and January, Makarov represented Russia at the 2012 World Junior Ice Hockey Championships and he won a silver medal for his country, making 57 saves in the gold-medal game against Sweden. Upon his return to Saskatoon, he played in only one period of a game against Regina when he was accidentally hit by Pats forward Morgan Klimchuk, which gave him a two-week-long concussion. Makarov registered his first WHL career shutout — one of two he recorded in 2011-12 — on February 24 against Kootenay. He finished the season with a 29-21-1-1 record in 54 games, registering a 3.01 GAA and a .913% save percentage, as well as the two whitewashes. When one hears the name Christopher Gibson, the term “import goalie” does not necessarily come to mind. The son of a black British martial artist and a white Finnish au pair, Gibson hails from Karkkila, Finland, a town in the same sub-region of the country as Helsinki, Vantaa and Espoo. In 2008, at the age of 16, the young Finn left home for Wilcox, Saskatchewan, to play for the Notre Dame Midget AAA Hounds; his teammates there included other CHL players such as Morgan Rielly (Moose Jaw Warriors), Brad Cuzner (Halifax Mooseheads), Bryce Milson (Drummondville Voltigeurs), Justin Sefton (Sudbury Wolves) and Francis Menard (Guelph Storm); he became the first player from Finland to ever play for the Hounds. The Chicoutimi Saguenéens took notice and they selected him 16th overall in the 2009 CHL Import Draft. He found himself sharing the crease with another first-year puckstopper, Robin Gusse, who was a year younger. In 29 games as a rookie, the 6’1″, 187-pound Gibson registered an 8-19-0-0 record with a 3.50 goals-against average and an .884% save percentage; he also had two shutouts. The next season was also Gibson’s draft year as his birthday is in December 1992; additionally, Gusse was traded so he became the #1 quite early, his new backup being another 1993-born goalie, Francis Desrosiers. 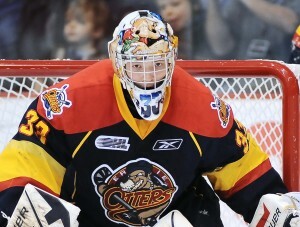 Gibson was also given the opportunity to play at the Home Hardware NHL/CHL Top Prospects Game. In 37 games in 2010-11, in which he always rendered a decision, he registered a record of 14-15-3-5; he also had a 2.42 GAA, a .920% save percentage (which was the best in the entire QMJHL) and four shutouts. He was even named a first-team All-Star. This allowed for Gibson to be chosen 45th overall in the 2011 NHL Entry Draft by the Los Angeles Kings. 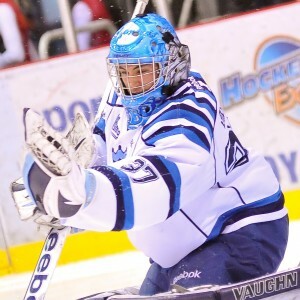 Gibson returned to Chicoutimi for his third season, again backed up by Desrosiers in 2011-12; he also spent time at the 2012 World Junior Ice Hockey Championships where he was himself a backup goalie, serving as Finland’s #2 goalie behind Colorado Avalanche draft pick Sami Aittokallio. In 2011-12, Gibson had a career year in wins as his 27-17-2-2 record in 48 games indicated; he also registered a 2.97 GAA, an .893% save percentage, three shutouts and, even more remarkably, five assists. In 2010-11, the Victoriaville Tigres were a team looking toward the future. They had one of the league’s rising stars, Phillip Danault, on their roster, as well as a stellar supporting cast such as Yanni Gourde, Brandon Hynes, Angelo Miceli and Philippe Halley. Part of their rebuilding included in goal after the graduation of Kevin Poulin to the New York Islanders organization. The Tigres found a goalie from Tabor in the Czech Republic who was playing for the under-18 team of HC Karlovy Vary whom they felt could be the #1 for their team; that goalie, who they chose with the 33rd overall pick in the 2010 CHL Import Draft, was David Honzík. At 6’3″ and 206 pounds, Honzík appeared in 36 games during his rookie season backing up incumbent starter Antonio Mastropietro, registering a 17-12-0-1 record, a 3.54 goals-against average and an .884% save percentage; he was also invited to participate in the 2011 Home Hardware NHL/CHL Top Prospects Game. The exposure paid off for him as he was chosen 71st overall in the 2011 NHL Entry Draft by the Vancouver Canucks. Honzík returned to Victoriaville in 2011-12, this time as the #1 goalie, rejoined by captain Danault, a 2011 first-round pick of the Chicago Blackhawks, and an offence with something to prove. In 43 games, nearly splitting the netminding duties evenly with rookie Brandon Whitney, http://youtu.be/vp3bopsb93E registered a record of 22-14-1-1 with a 3.49 GAA, an .885% save percentage and three shutouts. 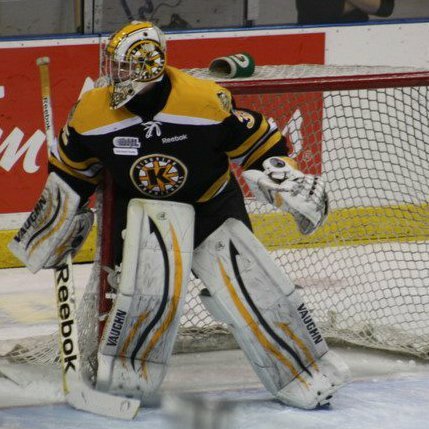 Upon the graduation of another import goaltender, Philipp Grubauer, in 2011, the Kingston Frontenacs sought an overage goalie who could play big minutes for them in 2011-12. They got what they were looking for in 6’6″, 220-pound Russian netminder Igor Bobkov. The Frontenacs acquired Bobkov, who was London’s 53rd overall pick in the 2010 CHL Import Draft, in a trade with the Knights in early June after the Anaheim Ducks 2009 draft pick was the backup to Michael Houser for most of his rookie OHL season. Ducks general manager Bob Murray wanted for Bobkov to spend another year in junior to hone his skills and become a solid #1; it helped knowing that Kingston is also Murray’s hometown. With a young team in front of him on most nights, especially with a youthful defence corps that saw its most veteran member eventually traded away, Bobkov was relied upon to step up even more than he would with a more experienced group of blueliners. After recording only four wins in 21 appearances in 2010-11 with London, the lanky native of Surgut, Russia, completely took over the reins in the Limestone City. Appearing in 58 games, Bobkov had surpassed his rookie season win total by November 13; he also completely decimated his statistics from the previous season. He finished with a 17-32-2-4 record on the season, quite remarkable for a team that had only 19 wins all year. Additionally, he had a rather solid 3.64 goals-against average and an impressive .902% save percentage, thanks mostly to 19 games in which he faced 40+ shots and two in which he faced 50 or more. He also recorded his first, and only, OHL career shutout on November 11 against Oshawa. His 58 appearances were third-most in the entire OHL in 2011-12, his 3300 minutes were fourth-most, and his 1839 saves were second-highest, ahead of everyone except his former creasemate Michael Houser. On the same day that the Windsor Spitfires traded their #1 goalie Jack Campbell to the Sault Ste. Marie Greyhounds, they also made a trade with the Niagara IceDogs that has been paying dividends. The Spitfires parted ways with Pittsburgh Penguins draft pick Tom Kühnhackl to bring in Czech netminder Jaroslav Pavelka, who was the 52nd overall pick in the 2011 CHL Import Draft. A native of Dvůr Králové nad Labem in the Czech Republic, Pavelka came to Windsor with the hopes of being the #1 goaltender, not just for the present but also for the future, a role he was not getting in Niagara. The 6’2″, 179-pound goalie appeared in 34 games for the Spitfires in 2011-12, registering a 12-14-3-1 record, a 3.47 goals-against average and a .905% save percentage. He ended the season with an overall record of 13-17-3-2, a 3.75 GAA and a .897% save percentage. As well, Pavelka recorded three shutouts with Windsor, the third being a 2-0 win over London on March 15 to secure a playoff berth for the Spitfires. 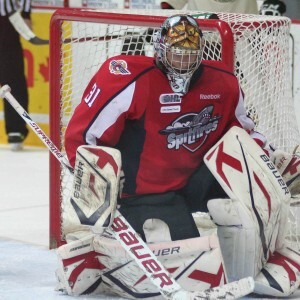 The Spits are looking to Pavelka to be their #1 goalie in 2012-13, due mostly to the graduation of overager John Cullen; he will become the tutor to either one of the team’s two young netminder prospects, Jordan DeKort and Dalen Kuchmey, both of whom saw backup duties with the Spitfires in 2011-12, especially DeKort who played in Windsor’s last game of the 2011-12 regular season against Sault Ste. Marie. 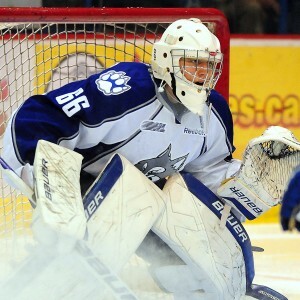 With Alain Valiquette having graduated and Jacob Riley traded, the Sudbury Wolves found themselves in a goaltending conundrum for the 2011-12 season. They took a step in the right direction when they chose Johan Mattsson 19th overall in the 2011 CHL Import Draft. The last pick in the 2011 NHL Entry Draft (211th overall), the Chicago Blackhawks prospect joined a Wolves squad still euphoric over a four-game sweep of the much-favoured Ottawa 67’s in the first round of the 2011 OHL playoffs. After reporting early to Sudbury from the Blackhawks’ training camp, Mattsson, a native of Huddinge, Sweden, had to sit out the first month of the OHL season with an injury; to make matters worse, his backup, Joel Vienneau, also had to miss time with an injury of his own. Upon his return, however, the 1992-born Scandinavian netminder had an excellent first month with his new team, recording seven wins in nine games, including a 33-save victory in his first game against Niagara, wearing the number 66, a tribute to his father’s birth year. The 6’4″, 192-pound Swede provided Sudbury with solid consistent goaltending throughout 2011-12. He did, however, miss some more time in late December and early January, serving as backup to Minnesota Wild prospect Johan Gustafsson at the 2012 World Junior Ice Hockey Championships, in which he and the rest of his Tre Kronor teammates won gold, thanks to a goal by Mika Zibanejad in a 1-0 overtime win over Russia. The felicity did not end there as Mattsson stopped 23 shots against Windsor upon his return to the Wolves. Mattsson finished the season with a record of 23-11-2-1 in 37 games, registering a 3.16 goals-against average and a .910% save percentage. It is an interesting story filled with perplexity of how Matěj Machovský became the #1 goalie for the Brampton Battalion. A native of Opava in the Czech Republic, Machovský was chosen 92nd overall in the 2010 CHL Import Draft by the Guelph Storm. 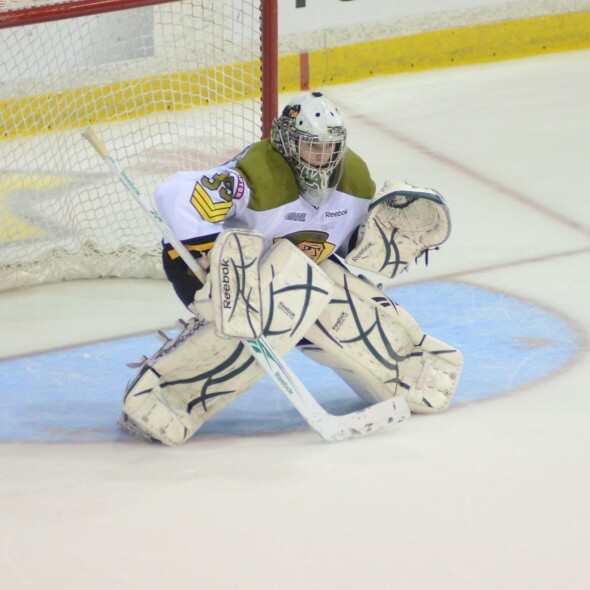 Battalion head coach/general manager Butler had been impressed with the young Czech, who made 51 saves in a game against his team at the Powerade Centre on October 24, 2010, one of only five appearances he had with Guelph before being traded. Going into the beginning of his tenure with the Battalion, the 6’2″, 195-pound goaltender had a 2-2-0 record, as well as a 4.10 goals-against average and an unbelievable .910% save percentage with the Storm. Machovský’s first month with Guelph saw him registered a 2-0-1 record, a 1.95 GAA and a .913% save percentage. He finished 2010-11 with a 5-11-0-2 record, as well as 2.65 GAA, a .901% save percentage and his first OHL career shutout on January 7, 2011, in London. His 2.90 GAA and .904% save percentage overall garnered Machovský the F.W. “Dinty” Moore Trophy for the best rookie goals-against average, the first time it had been won by a goalie traded midseason. Despite this, Machovský was not picked in the 2011 NHL Entry Draft; he did, however, attend the Ottawa Senators rookie camp as a free agent. Splitting the duties with rookie Keegan Wilson in 2011-12, Machovský finished this past season with a 24-13-0-4 record, a 2.36 GAA and a .902% save percentage in 42 games; he also registered five shutouts, the easiest being on January 19 in which he only stopped nine shots against Plymouth. After the Barrie Colts allowed 348 goals against in 2010-11, the most in the OHL, they found the answer to their goaltending woes when they found 1992-born netminder Mathias Niederberger whom they selected with the 25th overall pick in the 2011 CHL Import Draft. A native of Düsseldorf, Germany, Niederberger came as one of the most promising goalie prospects in his homeland; he was also expected to lead his country back to promotion at the World Junior Ice Hockey Championships. The 5’11”, 170-pound netminder also had eight games in the Deutsche Eishockeyliga to his credit. Niederberger recorded a win in his first OHL start and he easily became the man in goal for Dale Hawerchuk’s club. He had six wins in November 2011 and eight in February 2012. In fact, he recorded his first OHL career shutouts in the first two games of February. Niederberger did miss some time with a groin injury suffered during a game against Sudbury in early January but, upon his return, he only lost three times in regulation in his next 15 starts. He finished the season with a 29-14-1-2 record in 49 games, as well as a 2.68 goals-against average and a .918% save percentage with three shutouts. 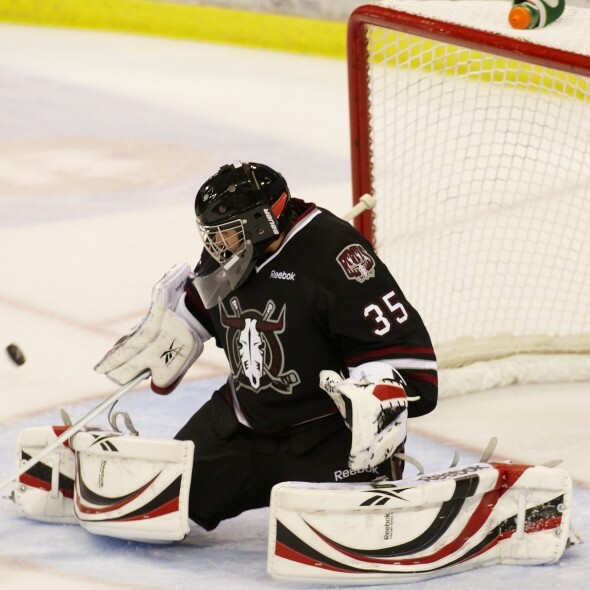 Going into the 2011-12 season, the WHL’s Red Deer Rebels knew that they would need to replace Darcy Kuemper’s 45 wins and 13 shutouts. It was not going to be easy but the team took a step forward during the 2011 CHL Import Draft. With the 59th overall pick, they chose a 6’1″, 181-pound goalie from the small town of Kopřivnice in the Czech Republic named Patrik Bartošák. In his homeland, he never had a goals-against average under 3.00 or a save percentage under .900% at both the under-18 and under-20 levels during the regular season; he also had won both an under-18 and an under-20 championship in 2009 with the junior teams of HC Vítkovice. The Rebels realized that he was definitely the best fit for them. Bartošák started his WHL career with two wins in three games and seven in October alone. He was also recognized as the CHL Goaltender of the Week for October 10-16, 2011, after he made 56 saves on 58 shots in two games against Lethbridge and Regina. Bartošák also recorded his first WHL career shutout against the Hurricanes on October 29, 2011, his first victory in a six-game win streak. After a shootout loss on November 18, 2011, against Lethbridge, the Czech rookie went on a seven-game losing streak which seemed to be a precursor for the Rebels’ free fall. It became further complicated when Bartošák suffered a shoulder injury on December 7, 2011, against Swift Current. The injury required surgery and, unfortunately, it rendered him out of action for the remainder of the 2011-12 season. Bartošák did manage to put up considerable statistics before his injury, though. He went 14-10-0-1 in 25 games with a 2.74 goals-against average and a .915% save percentage; his GAA was still good enough for ninth best in the WHL and his save percentage remained an impressive fourth best in the league. If people did not know who Petr Mrázek was before the 2012 World Junior Ice Hockey Championships, they surely know who he is now. 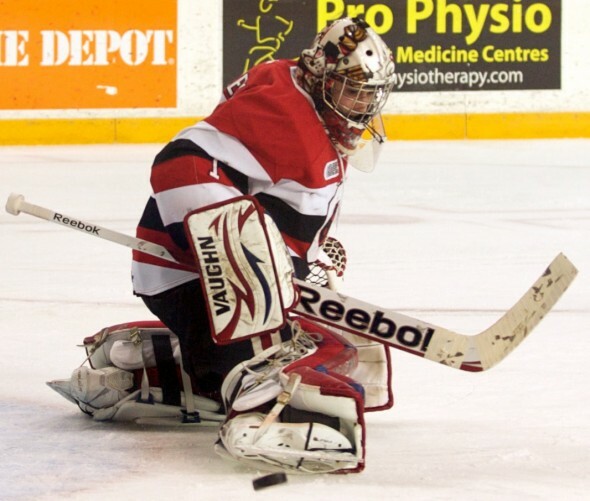 A native of Vítkovice in the Czech Republic, Mrázek has been one of the best goalies in the OHL ever since 2009 when he made his first start for the Ottawa 67’s. Brian Kilrea chose the 6’1″, 184-pound netminder 30th overall in the 2009 CHL Import Draft, with the possibility that he could become one of the top-ranked North American goalies for the 2010 NHL Entry Draft. With former #1 goaltender Adam Courchaine been traded, the goaltending duties in the Canadian capital in 2009-10 fell on the shoulders of Mrázek and Chris Perugini. The young Czech acclimatized right away, garnering a win in his first OHL career start; he also developed a keen sense for playing the puck. On November 29, 2009, Mrázek recorded his first OHL shutout; he would get two more before the end of the season. He finished his rookie season with a 12-9-0-1 record in 30 games, registering a 3.00 goals-against average and a .905% save percentage; he was also honoured with the F.W. “Dinty” Moore Trophy. The next year, his draft year, he had yet another fantastic season; he registered a record of 33-15-1-2 in 52 games, with a 2.84 GAA, a .920% save percentage and four shutouts. Unfortunately, an injury that sidelined him for some of the latter part of the season, and injuries to other key players, caught up to the 67’s and they were swept in four games in their first-round OHL playoff series against Sudbury. That summer, he was chosen 141st overall by the Detroit Red Wings at the 2010 NHL Entry Draft. Mrázek returned to the 67’s for his third and final OHL season in 2011 and, additionally, he was chosen to represent the Czech Republic at the 2012 World Junior Ice Hockey Championships. He helped the Czechs reach the semifinals, including a memorable quarterfinal performance against the United States in which his team upset the Americans 5-2. For his efforts, Mrázek was named the tournament’s top goaltender. Mrázek had yet another spectacular year for the 67’s in 2011-12, going 30-14-3-2 in 50 games, with a 2.84 GAA and a .917% save percentage, as well as three shutouts. When the Erie Otters lost another former import goalie, Jaroslav Janus, to graduation in 2009, they decided to replace him with another import. With the 36th overall pick in the 2009 CHL Import Draft, the Pennsylvania-based OHL franchise chose 6’4″, 225-pound Russian netminder Ramis Sadikov. A native of Moscow, Sadikov entered his rookie season in North America as a backup to Adam Courchaine; he managed to appear in 25 games, registering a record of 6-23-3-2, a 4.26 goals-against average and an .894% save percentage, thanks mostly to 11 games in which he faced 40 shots or more. The next season, Sadikov secured the #1 job and it paid dividends for him, making him one of the best goalies in the league. The Russian netminder appeared in 58 games, finishing with a record of 36-17-1-1, a 2.88 GAA and a .912% save percentage; he also recorded his only two OHL career shutouts. The Detroit Red Wings took notice and, after an impressive rookie camp, they signed Sadikov to a three-year entry level contract on August 21, 2011. After spending nearly the first month of the 2011-12 as a healthy reserve, he returned to Erie as an overager on October 22, 2011; he appeared in 25 games in total, mostly due to the Otters wishing to develop rookie netminder Devin Williams in the latter part of the year; he registered a 9-10-1-2 record with a 4.02 GAA and an .890% save percentage. Unfortunately, Sadikov was injured during one of the last games of the year and missed the remainder of the 2011-12 season. 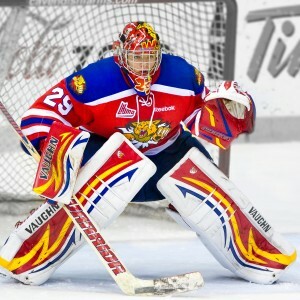 Going into the 2011-12 QMJHL season, the Moncton Wildcats were in major need of a #1 goalie. Their top netminder from the previous season, Shane Owen, had graduated, as did his backup Steve Gleeson. They traded Philippe Trudeau to Cape Breton and Jordan Kennedy opted to play in the Maritime Junior A Hockey League. That left them with only one returning goalie, rookie Brandon Thibeau. They set out for a goalie not only with experience but one who was older and could be a leader on a young team. Moncton eventually opted to choose Czech goalie Roman Will with the 29th overall pick in the 2011 CHL Import Draft; the Plzeň native had recorded a 2.24 goals-against average and a .935% save percentage in 48 games with the under-20 team of BK Mladá Boleslav in 2010-11; remarkably, like other talented young goaltenders in 2011, he was undrafted to the NHL. Will was a teammate that season with Tomáš Hyka, who was chosen eighth overall in the 2011 CHL Import Draft by the Gatineau Olympiques and had an impressive NHL preseason with the Philadelphia Flyers. The 6’1″, 188-pound goalie made an instant impact, recording a win in his first QMJHL career start and immediately becoming the #1 man in nets for Danny Flynn’s team. He also managed to record his first QMJHL career shutout, his only one during the 2011-12 season, on November 12 at home against Baie-Comeau. Will finished the season playing in 63 of the Wildcats’ 68 games; only François Lacerte of Gatineau played in more (65). He registered a record of 29-25-3-4 and his 29 wins tied him with Rimouski’s Jacob Gervais-Chouinard in the entire QMJHL. His 2.77 goals-against average was seventh-best in the league and his .913% save percentage was second only to a former Wildcats goalie, Phoenix Coyotes draft pick Louis Domingue of the Québec Remparts. With Rick DiPietro of the New York Islanders being a possible exception, no goalie has had worse luck over the last few years than Tadeáš Galanský. A native of Brno in the Czech Republic, Galanský was chosen 33rd overall in the 2009 CHL Import Draft by the Saginaw Spirit, who were looking for a rookie backup to their then-new #1 goalie Edward Pasquale. Everything started out great for the 6’4″, 212-pound netminder until he broke his ankle in training camp. Galanský’s injury kept him out of action until January 2010. When it came time for him to make his first OHL career start, he did not look out of place, making 25 saves in a win over Guelph. On February 14, 2010, his fourth start in the OHL, he stopped all 39 shots he faced against the Sault Ste. Marie Greyhounds to record his first career shutout. He finished the season with a 3-4-0-0 record in eight games, with a 3.66 goals-against average and a .915% save percentage. The next year, Saginaw made a deal with Barrie that saw the Spirit receive overage goalie Mavric Parks, who had led the OHL with a 2.32 GAA and a .930% save percentage the season before; to acquire Parks, Saginaw sent the OHL rights to Mark Scheifele to the Colts (and everyone knows how that has fared). Again, Galanský was relegated to the role of backup, but when Galanský started, however, he was stellar. He did not lose in regulation in any of his first eight starts of the season, which saw him go 6-0-2. Just like he had in the previous season, he recorded a single shutout at the mercy of the Greyhounds, stopping 18 shots on March 12, 2011, this time in front of the Saginaw home fans. In 17 games, he garnered a 9-5-0-2 record with a 2.89 GAA and a .910% save percentage, as well as the shutout. In 2011-12, Galanský was expected to be the #1 but he found himself outplayed by a precocious 1994-born rookie named Jake Paterson, who emerged starting most of the games from the beginning of the season. Galanský appeared in only 17 games this past season, going 6-6-0-1 with a 4.40 GAA and an .876% save percentage; he also garnered one shutout which was, once again, against Sault Ste. Marie, a 32-save blanking on November 25, 2011, after coming back from another injury. Eventually, Saginaw made a deal with Barrie that saw them acquire Clint Windsor, who became the new backup. Galanský decided to wait for a trade out of Saginaw but none came; he has since cleared OHL waivers and could possibly return to his former team, HC Kometa Brno, unless he gets a contract with another team in North America. Judging by these 13 examples, it appears obvious that the CHL is going to continue to resort to European import goalies to play big minutes for their teams as long as the talent pool remains deep. Somewhere out there may be another Halák or Pavelec, just waiting to be discovered. The upswing of goalies from Europe is incredible; there are so many who are just on the cusp of possible stardom. One just has to look at tournaments like the World Juniors and the World Under-18s to see the depth of talent in net across the ocean. It seems as though the import goalie is here to stay in the Canadian Hockey League and it will be for a while to come.